The ability to collaboratively communicate, and do it effectively, is of paramount importance in a higher education setting. Lectures and presentations ranging from simple board meetings to complex Ph.D. defenses are conducted in on-campus conference rooms at universities of all sizes. 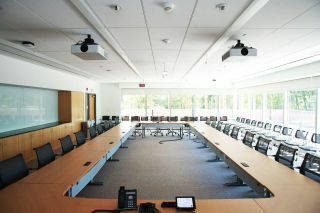 At Long Island, New York’s Stony Brook University, the largest conference room on campus is part of the school’s computer science department and it needed a serious communication system upgrade. The department also wanted to add a video wall to their main lobby. John Schappert of Adwar Video turned to ClearOne, knowing that their full array of communication solutions would produce a highly productive conference room and provide a first-rate video wall in the department’s lobby. ClearOne’s Beamforming Microphone Array 2 features ClearOne’s next-generation Acoustic Echo Cancellation and Noise Cancellation technology that addressed the echo issues the large room was experiencing under the outdated system Ruland alluded to. Ruland added the ClearOne system’s scalability has also been a major asset as well, and the department’s staff likes the flexibility of being able to add mics when the need arises. To upgrade the videoconferencing capability in some of the Science Department’s smaller to mid-size conference rooms, Ruland was also pleased with Schappert’s choice to install ClearOne’s Unite 200 PTZ cameras. The ClearOne UNITE 200 PTZ Camera is a versatile, professional-grade, HD video camera complete with USB, HDMI, and IP connections that can be used for a wide range of possible applications.